Visiting my parents last weekend, I came to a realization: we’re a bunch of cheapskates. Really! Half of my family’s conversations revolved around how we saved $2 buying slightly used socks last week or found a perfectly good blender at the recycling center... It was just sitting there! I’d like to say I’m different, but deep down I know that tendency to save money is hewn into my DNA. Let’s put it this way: I’ve been comparison shopping for a bicycle on Craigslist for 4 months now. Still, that doesn’t mean I don’t like to eat well. And though the thought of shelling out only $1 per serving for dinner sets my pulse racing with excitement, I’m not willing to skimp on flavor or nutrition to do so. Having said that, let me assure you: an awesome meal on an austere budget is not only possible, it’s easy! 1. Be meat smart: Boneless, skinless chicken breasts are convenient, lean, delicious...and the most expensive way to buy chicken. Instead, consider buying whole chickens and then roasting or grilling them. You can use the breasts for one meal, the legs for another and then use the leftovers to make soup. Not feeling that ambitious? Just opt for skinless chicken thighs instead of breasts, like in EatingWell’s recipe for Turkish Chicken Thighs. Chicken thighs are much cheaper, just as convenient and versatile, and because of a slightly higher fat content are virtually impossible to overcook! Plus, chicken thighs contain a little more iron and almost twice the zinc—not bad for a small incremental increase in calories over the chicken breast (177 calories and 6 grams fat for 3 ounces of thigh versus 138 calories and 3 grams fat for breast). Similarly, while it’s tempting to reach for nice cuts of beef or steak, ground beef is worlds cheaper and—when you opt for a lean blend—considerably better for you. 2. Love your spuds: Potatoes are one of the cheapest, most filling foods money can buy. Plus, they taste great and they’re nutritious too! Potatoes are a good source of fiber, potassium and vitamin C. And unless you’re eating an absolutely plain potato all by itself, its glycemic index (GI) value doesn’t matter. (It’s also worth noting that the glycemic index is an imperfect and controversial scale.) A high-GI potato becomes a low-GI meal if you simply add a little olive oil, because the added fat helps slow the absorption of the potato’s carbohydrates. Try shredding a delicious Russet potato to make latkes or slicing a few Yukon Golds and sweet potatoes into a satisfying Potato & Sweet Potato Torte for a vegetarian main course. At 30¢ per potato, you can afford to experiment! 3. Use your crockpot or slow cooker: How can you make a tough, cheap cut of meat delectable? How can you take inexpensive veggies and make them taste luxe? Throw them in your slow cooker! Simmering ingredients into stews and soups allows you to build complex flavors from the most basic ingredients. Even better: your effort can pay off into two or three meals from one pot of food, stretching your savings further, like with EatingWell’s recipe for Southwestern Three-Bean & Barley Soup. 4. Go meatless more often: Dollar for dollar, meat is an expensive way to get protein. Why shell out every night for a cut of red meat or a tray of chicken breasts when you can get the healthy protein and nutrients from beans, lentils or eggs? It’s not like you have to change your diet completely, either—I’m not talking about suddenly converting to vegan tempeh stir-fries or bulgur salads. In fact, just ditching meat a few nights a week can equal major annual savings. 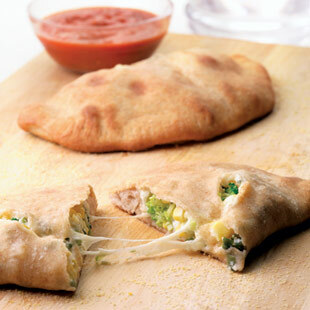 Don’t forget that many family favorites are naturally meatless, like EatingWell’s Cheesy Corn & Broccoli Calzones: it’s a sure-fire crowd pleaser!